This book explains fundamentals of Internet marketing programs and the options available to business leaders and marketing managers. You will learn how to perform email marketing, banner advertising, affiliate promotion, keyword marketing, search engine optimization, and how to select, setup and run online storefronts. 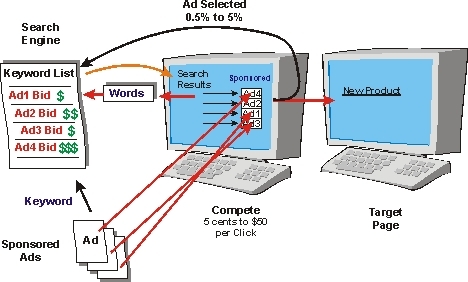 This diagram shows the basic keyword advertising process. In this example, four companies have submitted ads to a search engines that match a keyword. When an Internet user enters a search word into the search engine, the search engine provides the user with a list of URLs found along with a list of sponsored ads. The sponsored ad presentation (impressions) is organized with the highest bid on top and ads with lower bids positioned lower on the screen. 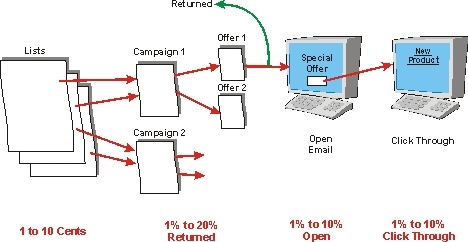 This figure shows an example email marketing process with some sample numbers. This example shows that email marketing is the process of managing lists, developing ad campaigns, creating promotional offers, broadcasting email messages, and tracking the results. This diagram shows an example of lists that cost 1 to 10 cents per name. Names in these lists are grouped to match specific marketing campaigns. These marketing campaigns have several promotional offers. The emails are broadcast and some of the emails are returned and 1% to 20% returns is typical. Of the emails that make it to the recipient, some of the emails are never opened. Of the 25% to 80% of the emails that are opened, approximately 2% to 10% click through to the specific product or service order page. Internet marketing offer the possibility to tracking almost every action a visitor or potential customer takes in response to marketing messages and how they navigate through their buying cycle. This book explains how to insert and use tracking codes on web pages and in cookies to find out how your web site visitors and customers react to your marketing programs. Search engine optimization (SEO) is the process or processes that adjust web site descriptions, keyword content, and links to/from other web sites to improve the relative ranking of the search engine list response to keyword searches. By using effective SEO processes, companies can lower their promotion costs by increasing the number and ranking position of organic (free) search results. Keyword advertising is a marketing process that uses key words that potential customers enter into search engines to find product or service information. Keyword advertising is a pull marketing process which matches your ads to people who are actively looking for solutions that you offer. Email marketing is the sending marketing and sales information using email messaging systems. Email marketing systems generally combine advanced message broadcast systems along with tracking systems that can monitor the reception, opening, and response to email messages that have been sent. 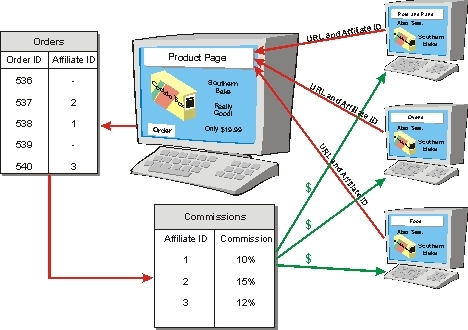 Affiliate marketing is the sharing of marketing and sales programs that compensates marketing affiliates (partners) for their role in communicating and selling to customers. Using internet marketing services, it is possible to automatically, track and manage and report to affiliate partners. Banner marketing is the insertion of graphic images on web sites that contain hyperlinks to web sites that offer additional information or products that are for sale. Using banner exchange networks, it is possible to automatically insert, track and compensate for banner advertising on other qualified web sites without having to contact tens or hundreds of potential advertising partners. A link exchange is the agreement by two (or more) companies to display web links, banner ads or images with hyperlinks on each other company's web site. In addition to producing more traffic between related web sites, link exchange programs increase the popularity and search engine ranking of web pages. Web portals are Internet web sites that act as an interface between a user and an information service. Web portals can provide specialized knowledge or other types of valuable information for web visitors which can be used to increase traffic and the types of visitors web portals can attract can be very qualified. An online storefront is a web site that enables visitors to find, order and pay for products and services. Online storefronts typically include catalogs, shopping cars and payment processing systems. There are many storefront options that can influence the effectiveness of a user experience and web analytics can be used to determine which mix of web pages, content choices, and product offers are most effective.